Spooktacular black cats at Devon rescue centre. 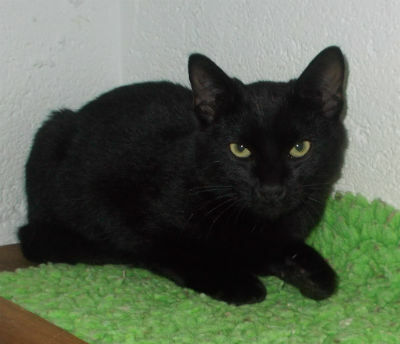 Niki Ging, manager of Wingletang Rescue and Rehoming Centre, near Tavistock, says “We have some adorable cats in rescue at the moment, including black cats such as Benjamin - a lovely, friendly boy of only six months old who was found as a stray”. Traditionally linked to witches, black cats are believed to bring good luck ­ yet the charity finds them the hardest felines to re-home. Margaret Green Animal Rescue is hoping prospective owners will choose the spookiest time of the year to adopt their very own lucky charm. The rescue also has four kittens that were found abandoned and in very poor condition. They are black and white and are only four months old. “The kittens were in a very sorry state when they came to us but are now fully recovered. They are playful and inquisitive, well-socialised and desperate to find a family of their own". The charity also has several other gorgeous kittens as well as young and older cats looking for homes.